The learning opportunity at our university is unique, in a genuine factory delegates learn in the ‘safe space’ of our facility. You leave the course having the ability to say that you have implemented Lean tools and techniques into a real shop floor environment. 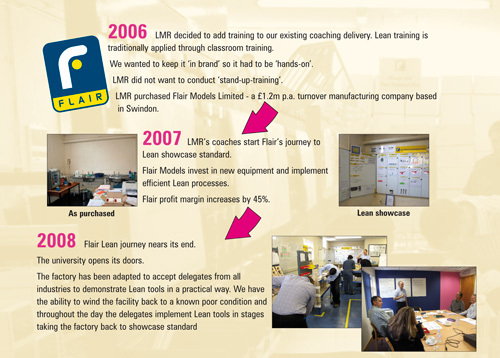 Each Lean tool starts with a short classroom session explaining the theory, followed by a ‘real-life’ implementation of that tool in the Flair factory for the next 3-4 hours. Lean tools are simple to understand - implementation is more difficult. Flair allows us to demonstrate the interaction with its employees that has to happen in real life. This interaction is one of the key experiences that the delegates take away from LMR’s university to then use in their own implementation. Delegates understand the tools but additionally you will understand how Lean effects the culture and emotion of employees that you are dealing with. LMR’s University delivers training courses from 1 to 5 days in duration.